The beneficial characteristics of Local Binary Pattern can be conserved by computing simple approach COMPLETE LBP (CLBP). The proposed technique called Binary Rotation Invariance and Noise Tolerant texture classification is mainly based this CLBP approach. This BRINT not just exhibits better execution than various late cutting edge LBP variations under ordinary conditions, but also performs significantly and consistently better in presence of noise due to its high distinctiveness and robustness. It likewise assessed to some kind of clamor levels (pepper and salt commotion, Gaussian) in common texture image. MLA Sureshkumar and Sachin Veerashetty. "Texture Classification Using Local Binary Pattern for Noise Images." International Journal for Innovative Research in Science & Technology 3.2 (2016) : 1-3. APA Sureshkumar and Sachin Veerashetty. (2016). Texture Classification Using Local Binary Pattern for Noise Images. International Journal for Innovative Research in Science & Technology, 3(2), 1-3. Chicago Sureshkumar and Sachin Veerashetty. "Texture Classification Using Local Binary Pattern for Noise Images." International Journal for Innovative Research in Science & Technology 3, no. 2 (2016) : 1-3. This feature is made available for the public for better interaction with the police. The E-FIR system is proposed to public for indirect interaction with police and to improve the E-governance facility. E-FIR system with E-portal. E-portal is specially designed website that brings information together from diverse sources in a uniform way. Usually each information source gets its dedicated area on the page for displaying information. Generally, many crimes seen by the citizens but they are afraid to complaint in police station due to fear of police department, lack of time and insensibility. Due to this fear many crimes not reported to the police station. Many cases are registered but due to lack of proofs and evidences and lack of collaboration of public they are not properly investigated. The aim of this study is to develop an online system which is easily accessible to police department, public and administrative department and to achieve e-transparency at various levels like publication, reporting, openness, accountability etc. The main objective of the study is to increase police and citizens interaction without going to nearby police station. It will help to reduce crime percentage and will save the time of people. It will also increase government and citizen interaction and will built an informed society. MLA Kirti Marmat, Kirti Marmat and Anand More. "E- FIR using E-Governance ." International Journal for Innovative Research in Science & Technology 3.2 (2016) : 4-9. APA Kirti Marmat, Kirti Marmat and Anand More. (2016). E- FIR using E-Governance . International Journal for Innovative Research in Science & Technology, 3(2), 4-9. Chicago Kirti Marmat, Kirti Marmat and Anand More. "E- FIR using E-Governance ." International Journal for Innovative Research in Science & Technology 3, no. 2 (2016) : 4-9. In Mobile ad-hoc networks (MANETs) assume that mobile nodes deliberate oblige with each other in order to work accurately. This cooperation is a costly activity; some nodes can refuse to cooperate, leading to selfish node actions. So, the overall performance could be gravely affects. The use of watchdogs is an eminent method to sense egotistic nodes. However, the revealing procedure performed by watchdogs can fail, generating false positives and false negatives that can bring to immoral operations. In term of exactness and speed. This is specially, delay tolerant networks (DTNs), occasionally watchdogâ€™s lacks owing to adequate time to notice the egocentric nodes. This mutual contact-based watchdog as a collaborative loom based on the dispersal of local egotistical nodes attentiveness when a contact occurs, so that information about precious nodes is swiftly propagated. This combined loom reduces the time and increases the exactitude when detecting egotistic nodes. MLA Sharanabasava and Ramesh Jadhav. "The Novel Approach for Finding Non Cooperative Nodes for Enhancing Network Performance." International Journal for Innovative Research in Science & Technology 3.2 (2016) : 10-12. APA Sharanabasava and Ramesh Jadhav. (2016). The Novel Approach for Finding Non Cooperative Nodes for Enhancing Network Performance. International Journal for Innovative Research in Science & Technology, 3(2), 10-12. Chicago Sharanabasava and Ramesh Jadhav. "The Novel Approach for Finding Non Cooperative Nodes for Enhancing Network Performance." International Journal for Innovative Research in Science & Technology 3, no. 2 (2016) : 10-12. With increasing use of Information Technology in the field of banking, science, medication, etc., there is an immense need to protect the data and systems from unauthorized access. Biometrics is used for authenticating and authorizing a person. The inadequate accuracy and reliability of traditional authentication and unimodal biometric systems has led many end users to make use of multimodal biometric fusion systems in order to provide the maximum level of accurate authentication. Multiple traits of a person can be utilized for increased and reliable recognition. This is the study on multimodal biometrics framework. MLA Jatin Azad and Nidhi Mittal. "Art of Security- Multimodal Biometric Fusion System." International Journal for Innovative Research in Science & Technology 3.2 (2016) : 13-16. APA Jatin Azad and Nidhi Mittal. (2016). Art of Security- Multimodal Biometric Fusion System. International Journal for Innovative Research in Science & Technology, 3(2), 13-16. Chicago Jatin Azad and Nidhi Mittal. "Art of Security- Multimodal Biometric Fusion System." International Journal for Innovative Research in Science & Technology 3, no. 2 (2016) : 13-16. In recent days it is found many of the electronic weighing machines which are made up of conventional materials. By using the composite material over the conventional materials it helps to meet diverse design requirements with significantly less weight. As well as increase in strength-to-weight ratio and also improves stiffness and impact properties. It also exhibits excellent corrosion resistance. Hence considering all these properties of composite materials, weighing machine can be made from composite materials, instead of conventional materials like steel, aluminum etc. This paper discusses the fabrication of composite plate by hand layup process. The fabrication involves reinforcing glass wool and copper sheet in epoxy polymer matrix. The load cell is embedded in between the two composite plates. The main emphasis of this work is fabrication of weighing machine made up of composite material. And these weighing machines are easily portable and less expensive. It can be used in laboratories and provisional shops for weighing purposes. MLA Baban Parisa Dathwade, Raghu M J, Kiran P, Manjunath N and Kiran A. S. "Design and Fabrication of Weighing Machine Made Up of Epoxy Matrix Composite Material Embedded with Load Cell." International Journal for Innovative Research in Science & Technology 3.2 (2016) : 17-23. APA Baban Parisa Dathwade, Raghu M J, Kiran P, Manjunath N and Kiran A. S. (2016). Design and Fabrication of Weighing Machine Made Up of Epoxy Matrix Composite Material Embedded with Load Cell. International Journal for Innovative Research in Science & Technology, 3(2), 17-23. Chicago Baban Parisa Dathwade, Raghu M J, Kiran P, Manjunath N and Kiran A. S. "Design and Fabrication of Weighing Machine Made Up of Epoxy Matrix Composite Material Embedded with Load Cell." International Journal for Innovative Research in Science & Technology 3, no. 2 (2016) : 17-23. The main objective of the project is to develop the loose biomass waste to briquettes primarily to explore value of application avenues. The loose biomass waste composites to briquettes are developed in India on the basis of two strategy of preventing depletion of agricultural and forest wastages. In this raw material marigold (gillyflower), rose flower, lemon peels, orange peels, gigantean leaves, thorny leaves to briquettes based composites material with the addition of Synthetic adhesives binder have been developed substitutes for coal charcoal of briquettes & high density and comparison of wood. In this project the biomass wastages were fabricated by combining materials of moulding box in copped from hand lay method. A synthetic adhesive (INDOCOL-DLD) was used as the matrix material. The mechanical and thermal properties of these samples were investigated according to IS and ASTM standards. From the result it was observed that the comparison of biomass briquettes and wood with high calorific value and density and also very less carbon sulphur emission. The biomass briquettes are equal amount of compressive strength and durability has been observed. Briquettes have much lower ash content (20-40% as compared to wood or coal). MLA M. Vijay and D. Krishnaiah. "Evaluation of Thermal and Mechanical Analysis of Loose Biomass Making Briquettes." International Journal for Innovative Research in Science & Technology 3.2 (2016) : 24-27. APA M. Vijay and D. Krishnaiah. (2016). Evaluation of Thermal and Mechanical Analysis of Loose Biomass Making Briquettes. International Journal for Innovative Research in Science & Technology, 3(2), 24-27. Chicago M. Vijay and D. Krishnaiah. "Evaluation of Thermal and Mechanical Analysis of Loose Biomass Making Briquettes." International Journal for Innovative Research in Science & Technology 3, no. 2 (2016) : 24-27. Many image processing mechanism have been carried out in the field of medical sciences. These image processing skills are used to spot the inner segments of human body for the diagnosis of the medicine. Now a day, brain tumor is a serious concern in the medical premises and the task reflects the use of revealing of the brain lump. Here, there is a presentation of the segmentation of brain MRI Image using K-means. Clustering algorithm followed by morphological filtering which keeps away from the miss clustered regions. The enormous variation of procedures intended for subdivision of MRI. descriptions are established to differentiate the intelligence growth. MLA Reshma and Sachin Veerashetty. "A K-Means Clustering Algorithm based Morphological Filtering of MRI Images for Detecting Brain Tumour." 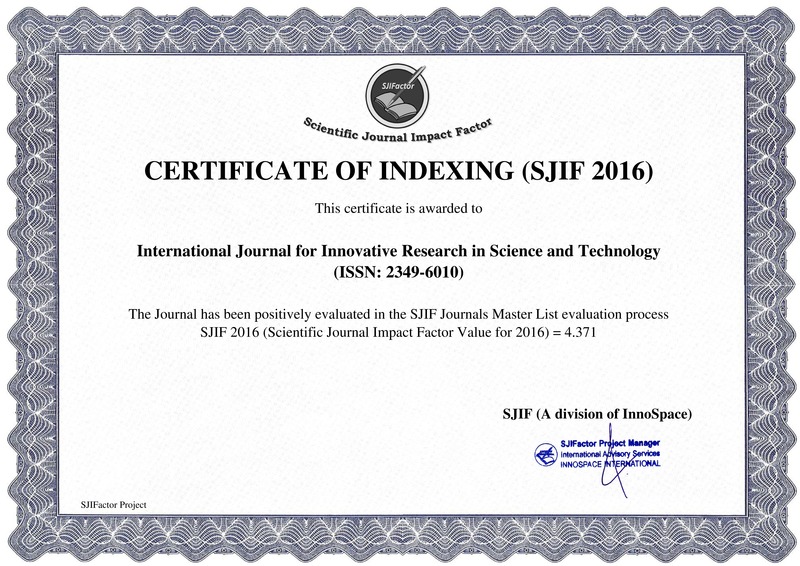 International Journal for Innovative Research in Science & Technology 3.2 (2016) : 28-31. APA Reshma and Sachin Veerashetty. (2016). A K-Means Clustering Algorithm based Morphological Filtering of MRI Images for Detecting Brain Tumour. International Journal for Innovative Research in Science & Technology, 3(2), 28-31. Chicago Reshma and Sachin Veerashetty. "A K-Means Clustering Algorithm based Morphological Filtering of MRI Images for Detecting Brain Tumour." International Journal for Innovative Research in Science & Technology 3, no. 2 (2016) : 28-31. Smartphones have become a necessity, more than a luxury. They are continuously used for purposes ranging from chatting to listening songs. All these tasks are basically a series of commands that are executed in accordance with each other so as to accomplish a common goal. Voice commands are gaining popularity day by day and natural languages form the heart and soul of these actions. With the rise in generations of mobile technology, it can also be seen that 5G is the future of mobile technology. Hence, in this paper, we have presented a voice input based operational model for 5G Smartphones. MLA Sonakshi Vij, Bharti Nagpal and Manoj Kumar. "Voice Input based Operational Model for 5G Smartphones." International Journal for Innovative Research in Science & Technology 3.2 (2016) : 32-36. APA Sonakshi Vij, Bharti Nagpal and Manoj Kumar. (2016). Voice Input based Operational Model for 5G Smartphones. International Journal for Innovative Research in Science & Technology, 3(2), 32-36. Chicago Sonakshi Vij, Bharti Nagpal and Manoj Kumar. "Voice Input based Operational Model for 5G Smartphones." International Journal for Innovative Research in Science & Technology 3, no. 2 (2016) : 32-36. Face recognition has been the most widely used application of image analysis. Its popularity is due to wide range of commercial and law enforcement applications and presence of latest techniques. It also has several applications in areas such as content-based image retrieval, video coding, video conferencing, crowd surveillance, and intelligent humanâ€“computer interfaces. But current systems are having laggings, which still needed to be worked upon like illumination and pose variations. This paper is a study of various techniques being used for face recognition. A face recognition system includes three steps face detection, feature extraction and face recognition. This paper includes various recognition techniques and descriptions of representative methods. The majority of face recognition methods have been developed by scientists with a very technical background such as biometry, pattern recognition and computer vision. The concepts and practical issues relating to the application of each step of a face recognition system and their various strategies are given, without going into technical details. The goal of this paper is to evaluate various face detection and recognition methods, provide complete solution for image based face detection and recognition with higher accuracy, better response rate as an initial step for video surveillance. Solution is proposed based on performed tests on various face rich databases in terms of subjects, pose, emotions, race and light. MLA Parveen Kumar and Daulat Sihag. "Face Recognition & Detection Techniques with Moving Objects." International Journal for Innovative Research in Science & Technology 3.2 (2016) : 37-41. APA Parveen Kumar and Daulat Sihag. (2016). Face Recognition & Detection Techniques with Moving Objects. International Journal for Innovative Research in Science & Technology, 3(2), 37-41. Chicago Parveen Kumar and Daulat Sihag. "Face Recognition & Detection Techniques with Moving Objects." International Journal for Innovative Research in Science & Technology 3, no. 2 (2016) : 37-41. Smart grids will provide more electricity to meet rising demand, increase reliability and quality of power supplies, increase energy efficiency, is able to integrate low carbon energy sources into power networks. This paper deals with the development and control of a smart grid-connected PV/WT hybrid system model. This model consists of wind turbine, photovoltaic array, asynchronous (induction) generator, controllers and converters (Sepic & Cockcroft). It is developed by using MATLAB/SIMULINK software package. In order to maximize the generated power, Cockcroft & Sepic convertors are used. Under various operating conditions, the dynamic behavior of the proposed model is examined. The inputs given to the developed system are the real-time measured parameters. The wind speed, solar irradiance and temperature data are collected from a grid connected solar power system located in Manchester. The control strategy of the proposed model results a better tool for smart grid performance optimization. MLA B Krishnapriya and Krishna Mohan Das. "Smart Grid Integration of Hybrid Energy System with Regulated Voltage using Cockcroft & Sepic Converters." International Journal for Innovative Research in Science & Technology 3.2 (2016) : 42-55. APA B Krishnapriya and Krishna Mohan Das. (2016). Smart Grid Integration of Hybrid Energy System with Regulated Voltage using Cockcroft & Sepic Converters. International Journal for Innovative Research in Science & Technology, 3(2), 42-55. Chicago B Krishnapriya and Krishna Mohan Das. "Smart Grid Integration of Hybrid Energy System with Regulated Voltage using Cockcroft & Sepic Converters." International Journal for Innovative Research in Science & Technology 3, no. 2 (2016) : 42-55.